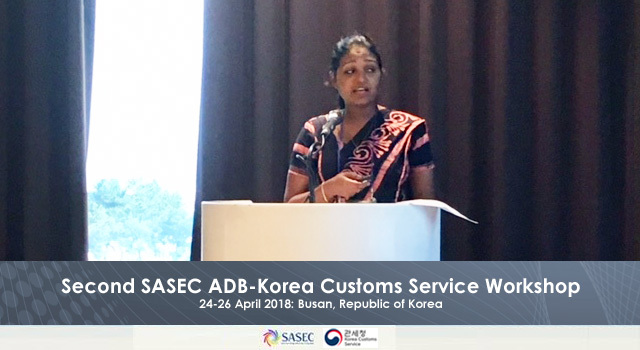 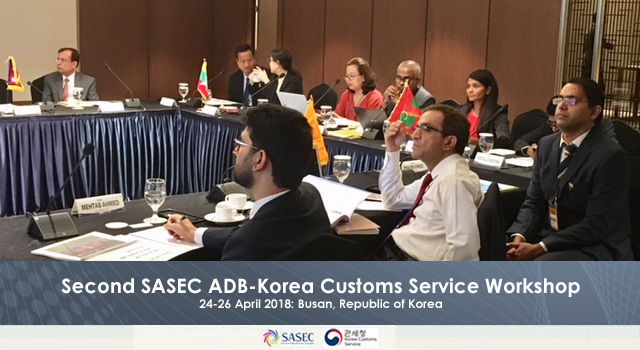 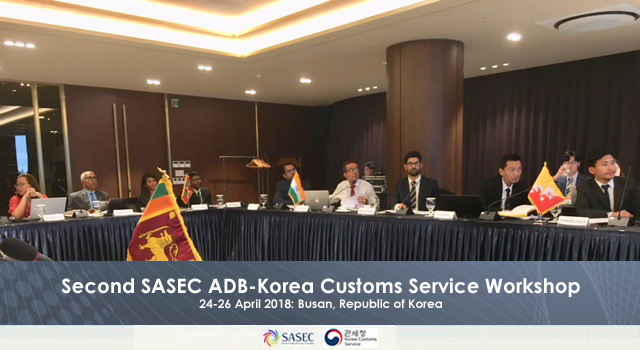 Korea Customs Service (KCS), in collaboration with the Asian Development Bank (ADB), hosted the Second SASEC Subregional Capacity-building Workshop on Implementation of the World Trade Organization Trade Facilitation Agreement (WTO TFA) on 24-26 April 2018, in Busan, Republic of Korea. 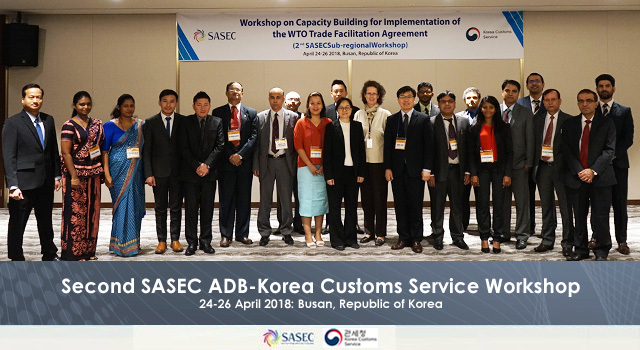 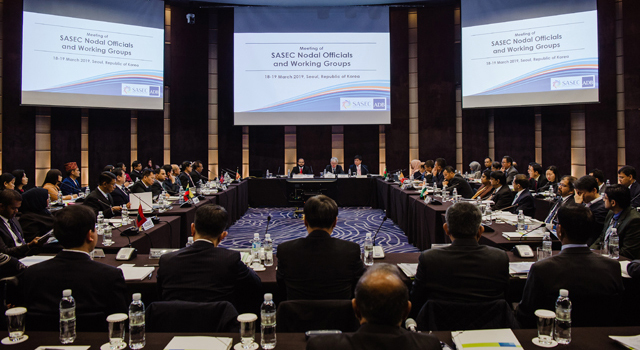 This follows the first subregional KCS-SASEC Capacity-building Workshop on WTO TFA Implementation, held on 21-23 November 2017, in Seoul, and is the second step in a joint multiyear initiative agreed by participating countries at the Sixth Meeting of the SASEC Customs Subgroup, held in June 2017, in Thimphu, Bhutan. 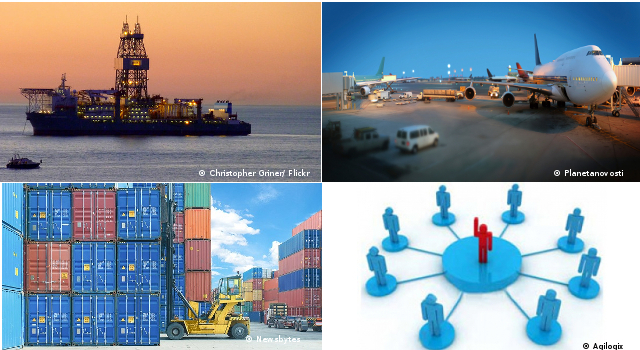 The multiyear initiative is designed to assist member countries enhance implementation of the WTO TFA. 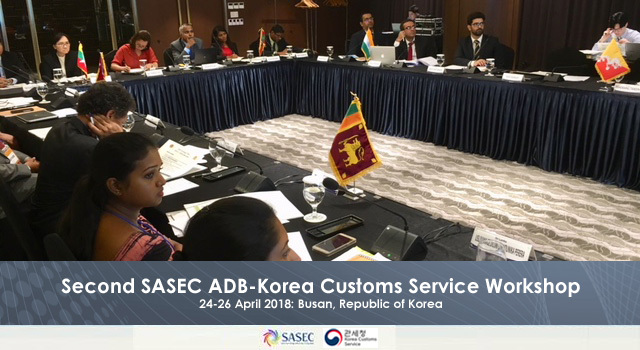 The Second Subregional Workshop (i) reviewed the national action plans drawn up at the first subregional workshop and subsequently approved by respective SASEC Customs administrations; and (ii) drafted tentative Agendas for national knowledge- and experience-sharing workshops to be held in participating SASEC countries on targeted areas of the WTO TFA. 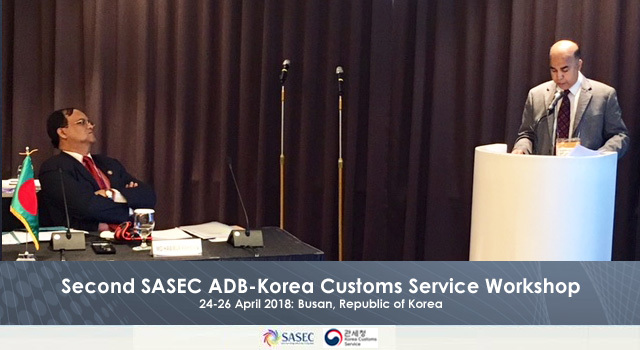 KCS experts will share their knowledge and experience at the national workshops, specifically in the areas of Time Release Study; National Single Window; Authorized Economic Operator Programs; Post-clearance Audit; Advance Ruling; Risk Management; Testing Procedures; and Pre-arrival Processing. 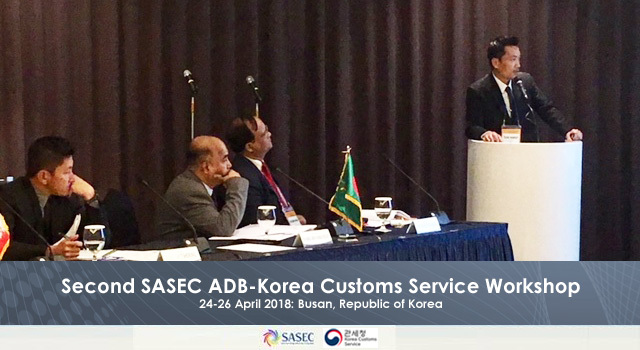 Mr. Jaeho Jung, Director, Multilateral Cooperation Division, KCS opened the Workshop, welcoming participants and recapping the aims of the KCS-SASEC partnership to facilitate knowledge and experience-sharing. 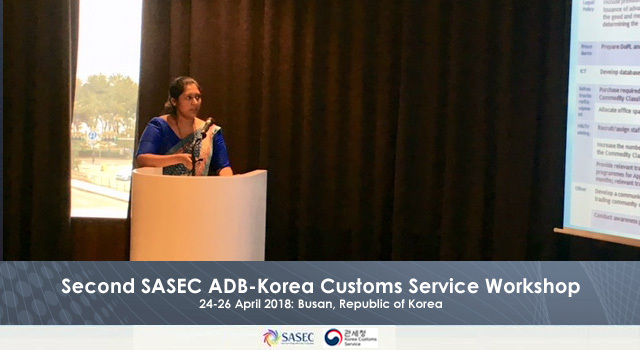 Dr. Rose McKenzie, Senior Regional Cooperation Specialist, ADB delivered Opening Remarks, noting the value of south-south opportunities to exchange knowledge and experience, and recalling the economic benefits of developing and applying a regional approach to trade facilitation reform and modernization. 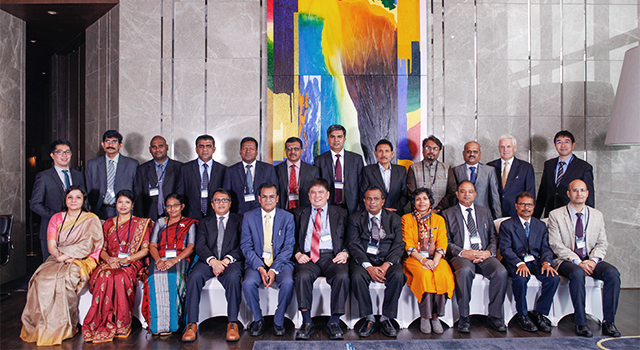 The third and final step of the multiyear initiative will be the conduct of national workshops in Bangladesh, Bhutan, Maldives, Myanmar, Nepal, and Sri Lanka, focusing on country-identified topics to facilitate Customs implementation of the WTO TFA in an effective and timely manner, and with the continued support of KCS WCO-accredited experts and ADB. 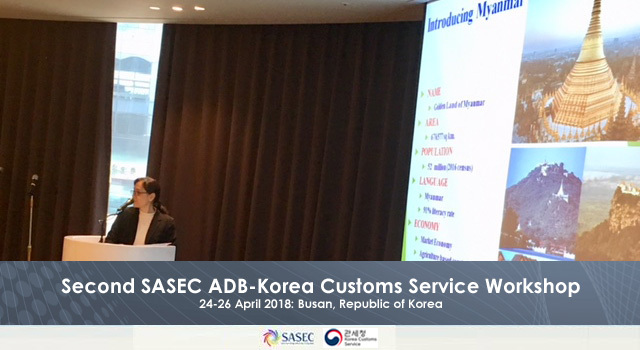 As part of the Workshop, KCS organized a field visit to the New Port of Busan where participants toured the truck scanning facilities as well as the working areas of the port. 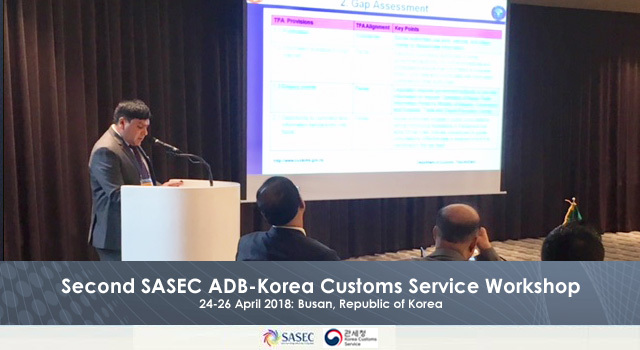 This joint multiyear initiative is supported by the Government of the Republic of Korea through Official Development Assistance, and ADB technical assistance.